The Mangrove service area is next to the westbound side of the A45, but accessible in the other direction using a flyover. The flyover route is not suitable for HGVs, despite HGV parking spaces being available if you could get there. It is often nicknamed 'Blue Boar'. First two hours free for all vehicles, after which all vehicles must pay £8 for up to 24 hours or £10 for overnight parking. Prices can be paid in the forecourt. 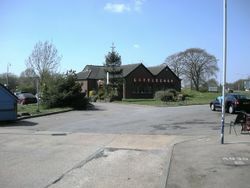 The petrol station opened in the late 1950s, next to Blue Boar Farm. The Blue Boar name relates to a local legend that one was spotted in the pond at the back, and the operator decided to take on that name. 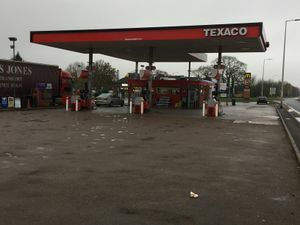 Despite the exit still being known as the Blue Boar turn, the service area has been officially called 'Mangrove service station' for some time. Some sources say 'Dunchurch services'. The Dunchurch branch of Little Chef opened next to the petrol station in 1988. It closed in 22 August 2012, becoming the McDonald's.